With Christmas and New Year celebrations well and truly past, it's that time of year when reality starts to hit. Yes, it's time to head back to work and start climbing that corporate ladder...all over again! 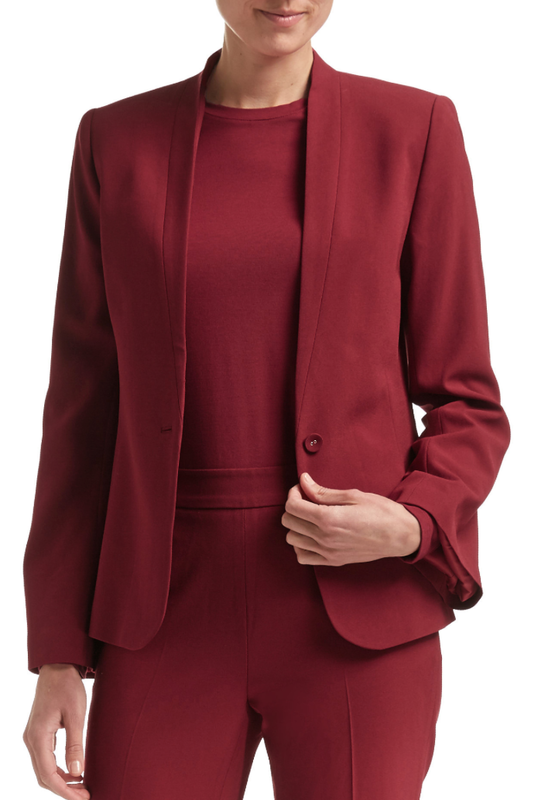 If your corporate wardrobe consists nearly entirely of black skirts and dresses, it's time to up the boardroom fashion stakes! Introduce colour, pattern or texture with a statement jacket to add an element of personality to any outfit. Perfect to throw on over a dress or team with a blouse and skirt, a statement jacket is the quickest way to elevate your existing workwear. Designer elements such as shoulder pads (but not the 80's kind), flared sleeves, waterfall fronts and ruffles are easy ways to push the fashion envelope and ensure your statement jacket is worthy of a promotion. Lisa wears Indigo dress and Mollini shoes. Workplace culture is shifting and these days many offices allow for a more relaxed corporate style. If you're lucky enough to have some flexibility in what you can wear to work, consider converting some of your weekend wear to weekday chic. Many shirts and tops can be given a refresh by tucking them into a pencil skirt, and when it comes to looser style dresses, simply add a belt to give a more structured look. Think outside the usual range of heavy structured fabrics as well, to broaden your office outfit options. Linen dresses and shirts are a wonderful way to bring a relaxed element to your ensemble, whilst keeping shoes and accessories more formal. Kick off those old trousers and suit jackets, and step into a statement jumpsuit! A tailored jumpsuit in a solid colour such as black, grey, cream or navy is a fresh, modern take on the power suit. The versatile jumpsuit can easily be dressed up or down, accessorised with some statement jewellery and can transition from desk to dinner. As the weather cools down you can also layer a blouse underneath your sleeveless jumpsuit or wear a blazer or cape jacket over the top for the ultimate in girl boss chic. Desk essentials from Dymocks 'Art Of Giving Store'. Lacking the motivation to kick start the working year? We've all heard that a change of scenery does the power of good, and while it might not be feasible to move your entire office, you can make some simple changes to your daily outlook by updating your work surrounds and desk. Diaries, planners, note books and stationery are great ways to introduce your own personal flair and provide a little motivation to brighten up an otherwise dull work day. Whether it be your home office or office cubicle, there are plenty of ways to update, refresh and refocus at the start of the working year. If your workplace has strict dress codes or requires that you wear a uniform, then there's still plenty of ways to refresh your look in a subtle way. Whether it's a bright nail polish or simply a new hair style, groom your way to corporate success by channelling your inner glam girl. So long as nails are kept well maintained and at a reasonably short length, a mani/pedi can be considered almost an additional accessory to your outfit and one that will be acceptable in just about any workplace. The finishing touch to any outfit is always the accessories. This is especially true when it comes to corporate wear which usually errs on the side of being conservative. By adding a stylish statement bag, you'll easily transform the look of any work outfit. Totes and structured bags in a medium to large size are best to carry to the office; big enough for all of those daily essentials, but can also squeeze in a laptop, files or a change of clothes for afterwork, if need be. We all know that if you give a girl the right shoes, she can conquer the world...and this couldn't be any truer for the workplace! Shoes are the perfect way to refresh your daily corporate style, but in this instance, it's important to consider style and comfort. While those skyscraper stilettos are perfect for Friday nights, when it comes to back to work Mondays, look instead for shoes that will support you throughout the workday. Block heels, kitten heels and flats are going to be your best friend after a long day on your feet climbing that corporate ladder and will allow you to focus on the task at hand, rather than reaching for the Band-Aids. All items featured can be found in-store at Collins234. * This post was sponsored by Collins234 however the opinions are my own.